It’s been ten years since Heart recorded their debut album Dreamboat Annie at Vancouver’s Mushroom Studios. At a time when Saturday Night Fever was running rampant that LP–with songs like “Magic Man” and “Crazy On You”–struck an important blow for guitar-driven rock and roll. 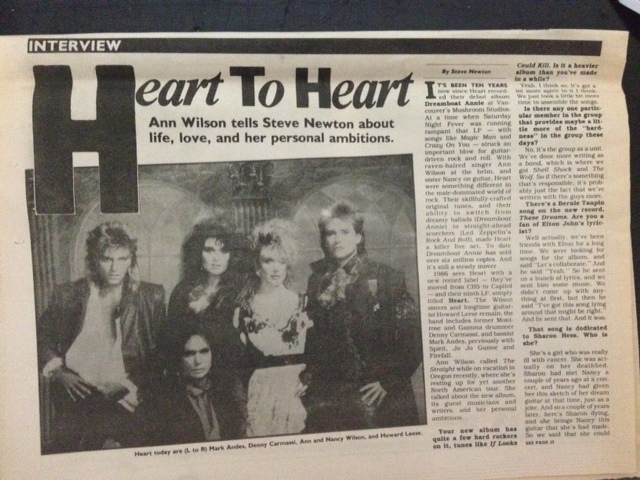 With raven-haired singer Ann Wilson at the helm, and sister Nancy on guitar, Heart were something different in the male-dominated world of rock. Their skillfully crafted original tunes and their ability to switch from dreamy ballads (“Dreamboat Annie”) to straight-headead scorchers (Led Zeppelin’s “Rock and Roll”) made Heart a killer live act. To date Dreamboat Annie has sold over six million copies. And it’s still a steady mover. 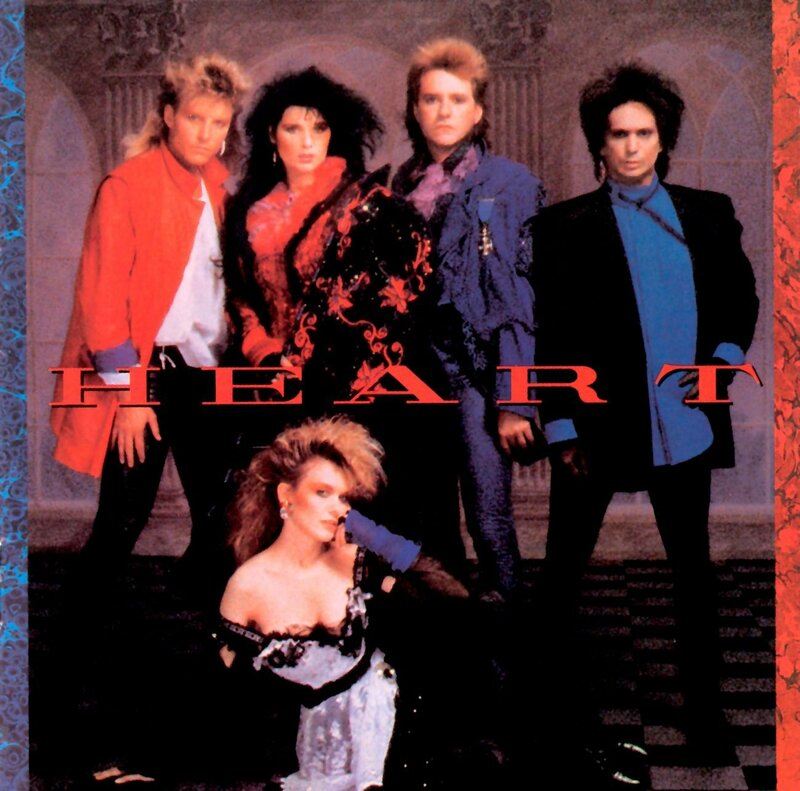 1985 sees Heart with a new record label–they’ve moved from CBS to Capitol–and their ninth LP, simply titled Heart. 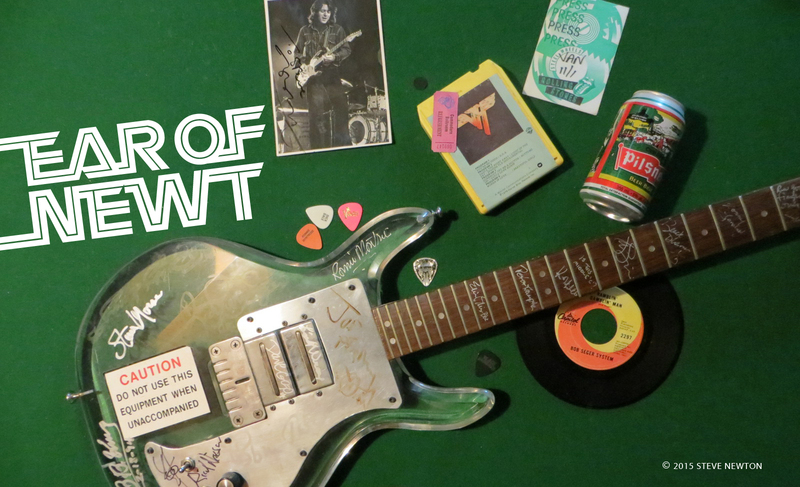 The Wilson sisters and longtime guitarist Howard Leese remain; the band includes former Montrose and Gamma drummer Denny Carmassi, and bassist Mark Andes, previously with Spirit, Jo Jo Gunne, and Firefall. Ann Wilson called the Straight while on vacation in Oregon recently, where she’s resting up for yet another North American tour. She talked about the new album, its guest musicians and writers, and her personal ambitions. Your new album has quite a few hard rockers on it, tunes like “If Looks Could Kill”. Is it a heavier album than you’ve made in a while? Yeah, I think so. It’s got a lot more spirit in it I think. We just took a little bit more time to assemble the songs. Is there any one particular member in the group that provides maybe a little more of the “hardness” in the group these days? No, it’s the group as a unit. We’ve done more writing as a band, which is where we got “Shell Shock” and “The Wolf”. So if there’s something that’s responsible, it’s probably just the fact that we’ve written with the guys more. There’s a Bernie Taupin song on the new record, “These Dreams”. Are you a fan of Elton John’s lyricist? Well actually, we’ve been friends with Elton for a long time. We were looking for songs for the album, and said, “Let’s collaborate”. And he said, “Yeah.” So he sent us a bunch of lyrics, and we sent him some music. We didn’t come up with anything at first, but then he said, “I’ve got this song lying around that might be right.” And he sent that. And it was. That song is dedicated to Sharon Hess. Who is she? She’s a girl who was really ill with cancer. She was actually on her deathbed. Sharon had met Nancy a couple of years ago at a concert, and Nancy had given her this sketch of her dream guitar at that time, just as a joke. And a so a couple of years later, here’s Sharon dying, and she brings Nancy this guitar that she had made. So we said that she could hang around the studio for a a while, and then one day she….didn’t come, because she was too ill. And she died. And so Nancy dedicated the song to her. There’s a couple of tunes by Holly Knight on the new album. She’s also written songs for people like Tina Turner, Pat Benatar, and Scandal. Yeah, we’ve gotten to be pretty good friends with her too. When we were down in L.A. recording, she came round to my flat, or I went to her place, or we went to Nancy’s. And it was really fun! [laughs]. It was like “Lookout!,” you know, Three gals and a bottle of Dubonnet! You’ve got a lot of “friends” on the album. Yeah, that was one of the best parts about having people like Grace Slick and Mickey Thomas and all of them, you know. It wasn’t so much like we hired people to come in it was more like a collaboration. There was a real good feeling about it. And Peter Wolf, is he a friend of yours too? Well, that’s not Peter Wolf from the J. Geils Band. He’s a German guy, and he plays keyboards. He’s on that Commodores album Night Shift. He plays that really cool keyboard sound. So it isn’t the same guy that makes a balloon out of his hand [laughs]. I understand that Nancy had bit parts in a couple of films: Fast Times at Ridgemont High and The WIld LIfe. Have you ever aspired to be an actress at all? Yeah, boy I sure have. I’ve gotten a bunch of scripts sent to me and stuff, but never the right ones. They’re always like these old kind of Janis Joplin, hard-drinkin’, hard-livin’ gal type roles. But, you know, my ship will come in. Is that the image that people have of you, do you think? I guess, you know. Maybe I have perpetuated it [laughs]. I must have, to get all these roles sent to me where I swear and have to guzzle out of a bottle and smash it against the wall. Nancy plays lead guitar on a couple of your new songs. Do she and Howard Leese sit down and trade licks much? Yeah, they’re playing more and more together, and she’s really benefiting a lot from playing with him because he’s really good for rock. Her base being acoustic guitar, she’s really anxious right now to learn as much as she can about playing electric. So Howard’s helping her a lot, and also she has a new guitar roadie and friend named Scotty Olson who’s a really good guitarist in his own right, and he’s spent a lot of time working with her. Do you ever play guitar? Yeah, I play guitar, but not well enough to play in the band. With people like Howard and Nancy around it would be kinda silly if I played [laughs]. It’s more a songwriting tool for me, you know. When was the last time you were in Vancouver? I went up there just recently, to go shopping, frankly [laughs]. It’s so great up there, for clothes and everything. And I stayed downtown, ’cause I don’t have a house anymore. Are you living in Seattle right now? Do all the band members live there? No, just Nancy and Howard and I. Denny Carmassi lives in San Francisco and Mark Andes lives in L.A. So we’re spread all up and down the whole west coast now. Are Nancy and Howard boyfriend and girlfriend? No, she has another boyfriend who’s been with her for four years now. He’s a screenwriter. Well I don’t have any one steady boyfriend, but I’m seeing a couple of different guys [laughs]. I don’t know, I just don’t really feel like settling down yet, you know. I suppose when he–the big “he”–comes along I’ll do it without a backward glance. You haven’t played Vancouver for several years now, have you? I know! It’s really a drag! We just spend so much time playing the States. It’s such a huge country with so many places to play. And I’m not proud of the fact that we haven’t played Vancouver; I think that the people up there deserve to hear us. So this time, on the second leg of the tour, we’re gonna come back and play Canada. Or bust!